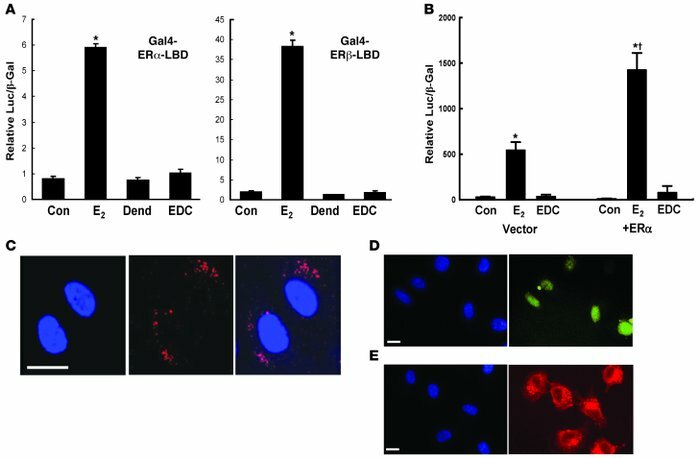 EDC does not activate nuclear ER function in cultured cells. (A) HEK293 cells were transfected with either an ERα-based or an ERβ-based Gal4-ER-LBD chimera and the Gal4-responsive luciferase reporter plasmid TKMH100X4-Luc, and reporter activity was determined after 24 hours exposure to vehicle (control [Con]), 10–8 M E2, dendrimer (Dend) alone at a concentration equivalent to EDC, or EDC at a concentration equivalent to 10–8 M E2. (B) BAECs were cotransfected with 3ERE-Luc luciferase reporter plasmid and either empty vector or ERα construct, and reporter activity was determined after exposure to vehicle, E2 or EDC as in A for 48 hours. In A and B, values are mean ± SEM, n = 3–4. *P < 0.05 versus Con; †P < 0.05 versus vector. (C–E) EDC does not enter the endothelial cell nucleus. BAECs were treated with Cy5-labeled EDC (red) or fluorescein-labeled estrogen (yellow) for 24 hours, and subcellular localization was evaluated by laser scanning confocal microscopy (C) or by epifluorescence microscopy (D and E). Nuclei were imaged with DAPI (blue). Scale bars in C–E: 20 μm.